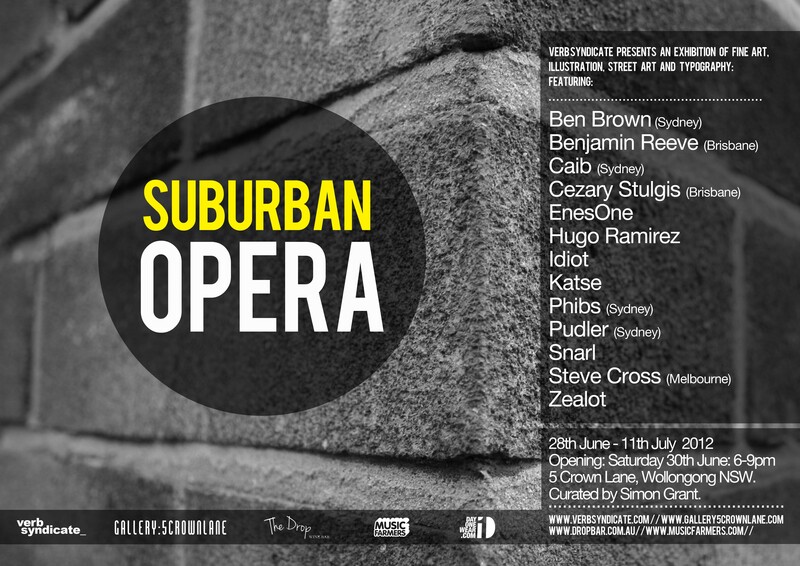 Suburban Opera – An exhibition of fine art, illustration, street art and typography. Exhibition from 28th of June – 11th July. 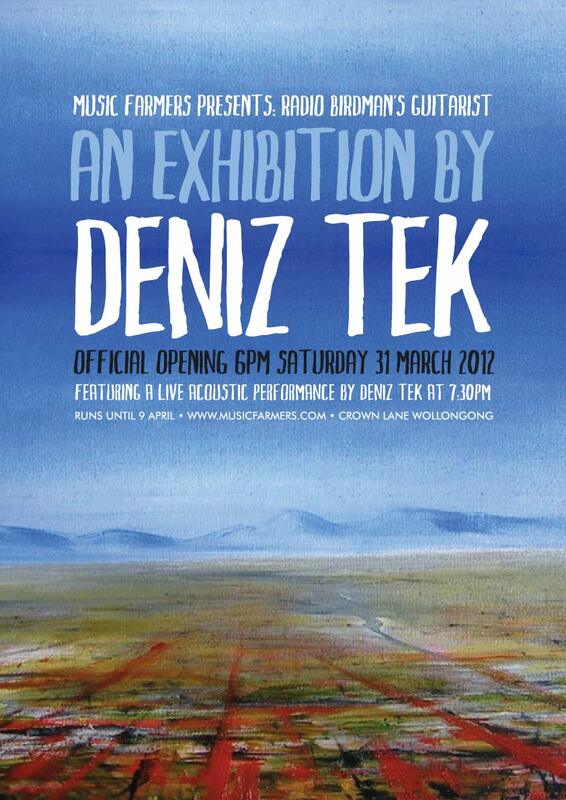 Music Farmers are proud to be bringing the art work of Deniz Tek to Wollongong. Lauded as the lead guitarist for legendary Australian band Radio Birdman (who were inducted into the ARIA Hall Of Fame in 2007), Deniz Tek became interested in art and music during his childhood in Ann Arbor, Michigan. As well as playing in Radio Birdman, he also formed New Race alongside band mate Rob Younger and members of legendary Detroit bands The Stooges and MC5. Deniz has also had an extensive solo career as a musician and the opening of his exhibition will also feature an acoustic solo performance from him. Alongside his interest in music and art, Deniz studied medicine at both University of Michigan and the University of New South Wales and between touring, works as a specialist in emergency medicine in both Australia and the USA. His work has currently brought Deniz to the Illawarra and he is using the opportunity to exhibit his art work in Wollongong. An avid fan of 19th-century impressionism and mid 20th-century abstract expressionism, his paintings have been exhibited in regularly in Sydney. Deniz also does small ironwork sculptures which have been shown in Montana, USA. The Exhibition will run at Gallery 5 Crown Lane in Wollongong from Saturday March 31st until Saturday April 7th. The official opening will be on Saturday March 31st at 6pm. Deniz will perform a solo, acoustic set at 7:30pm. The IWD Exhibition celebrates International Women’s Day for 2012 and is an exciting coming together of thirteen women artists living in Wollongong. The artists have a great wealth of experience and activism both in the women’s movement and in the arts. The exhibition acknowledges and celebrates their creativity and commitment to the arts in Wollongong. The exhibition includes artists who work in a variety of mediums, including painting, sculpture, drawing, printmaking and photography. Artists in the exhibition include Liz Jeneid, Kathryn Orton, Clare Wallace, Jasmin Carter, Joni Braham, Sue Bessell, Moira Kirkwood, Geraldine Lefoe, Greer Taylor, Jack Draper, Lara Seresin, Mai Nguyen-Long and Sue Smallkowski. The exhibition has been coordinated and curated by Sue Bessell. 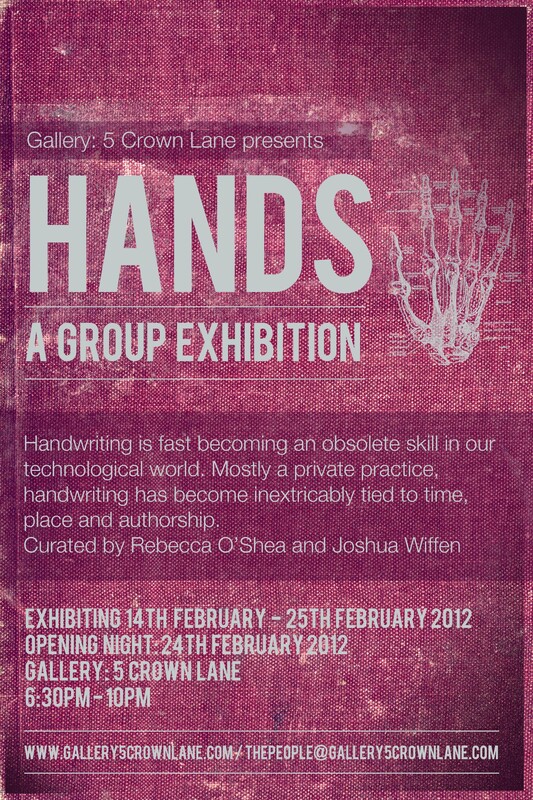 The Exhibition will be opened by Dr Penny Harris from the Faculty of Creative Arts, University of Wollongong. Musical Performances at the Exhibition Opening on Friday 9th March 2012 at 6.30pm will feature solo Electronic Violin player Jane Aubourg, and jazz singer Anna Gerard and locl singing trio Sha Na Na. Since its inauguration a little over a year ago, Gallery: 5 Crown Lane has hosted a number interesting, well attended exhibitions and events, thereby cementing its place in the cultural fabric of the Illawarra. 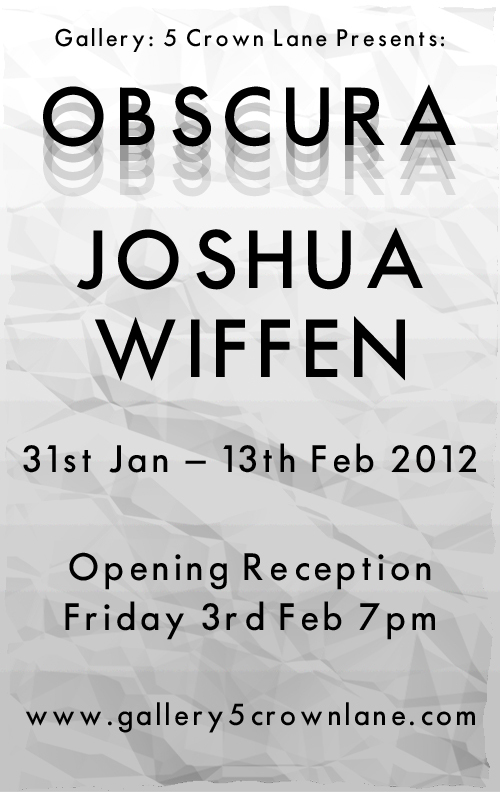 2012 now sees the end of its first 12 month artist residency with the culminating exhibition ‘Obscura’ by Joshua Wiffen. Wiffen has spent the residency period experimenting and exploring his creative practice whilst at the same time being heavily involved in curating and organising exhibtions in the gallery space. The resulting exhibition is an installation blending fine art ideals with contemporary public practices albeit adapted to the confines of the gallery environment. Some of the work on display has been represented in galleries in both Queensland and Victoria. Gallery: 5 Crown Lane is proud to present the artists first exhibition of 2012 and would like to extend an open invitation to join us at the opening of ‘Obscura’ Friday 3rd February 7pm. Gallery: 5 Crown Lane is open for viewing, sales and enquiries Monday – Friday 10am-5pm, Saturday 10am – 4pm or by appointment. 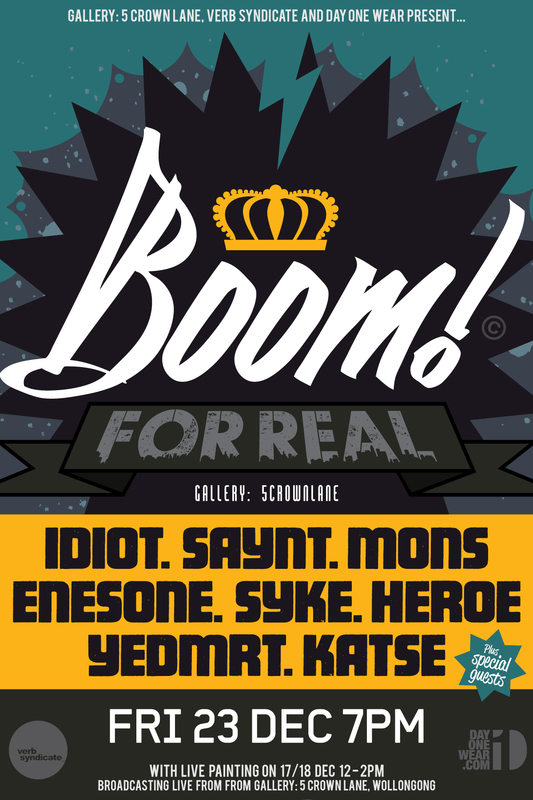 The weekend of the 17th of December sees a bunch of local graffiti artists take to the walls of Gallery: 5 Crown Lane as part of the annual Christmas Party Jam which is due to take place on the 23rd of December at the gallery. Last years show ‘It’s Official’ saw more than 200 people come through the doors on opening night and this year is set to be just as big!! 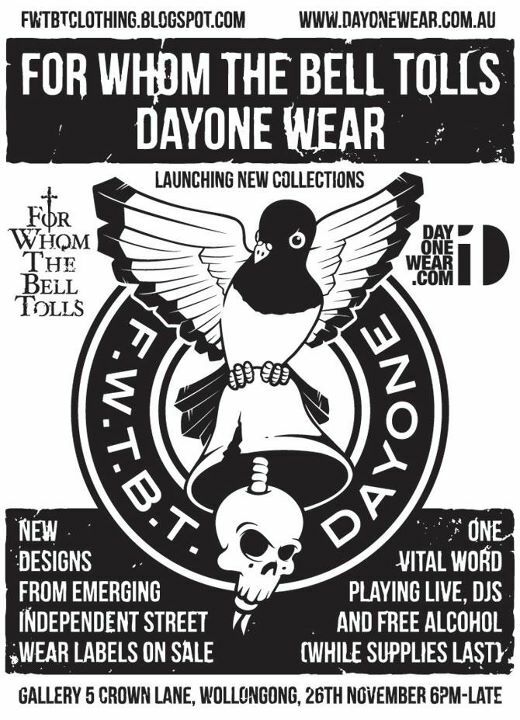 For Whom The Bell Tolls and DayOne Wear Product Launch!! Enter your email address to subscribe to Gallery: 5 Crown Lane and receive notifications with news, new posts and upcoming events by email.